In a press release, Globe gratefully thanked its customers for making Globe to be the fastest growing telecommunication company in the Philippines. 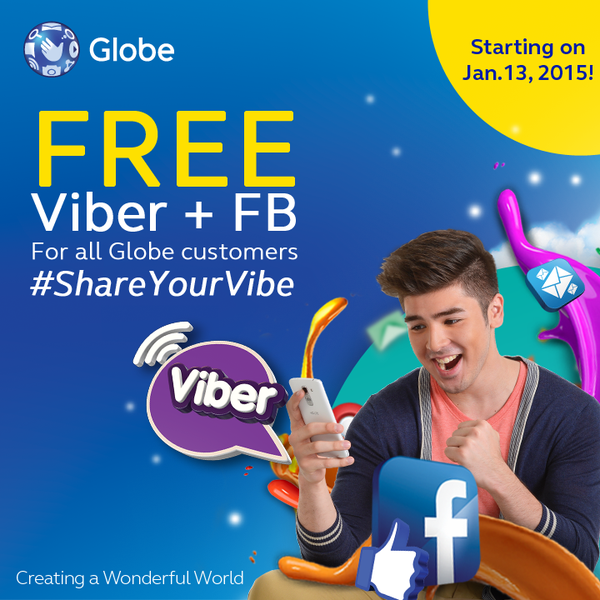 With that, Globe don't want to give 2015 to start without thanking its customers, STARTING January 13, 2015, and for an entire month, or 18 days, FREE FACEBOOK will be again enjoyed by the subscribers. For the love month, leading up to Valentines Day, the company offers FREE VIBER to all GLOBE customers in the Philippines. Yes, no purchase required. No Promo required. No daily registration required. And is available to all Globe subscribers (mobile and Tattoo SIM) nationwide!